Scientists and activists alike have been looking for a solution to the problem of aquatic nutrient pollution. Now one group reports in Environmental Science & Technology that ribbed mussels are up to the clean-up challenge. When it comes to nutrients, like nitrogen and phosphorus, too much of a good thing can be bad. These nutrients end up in rivers and streams as the result of human activities and can cause algal blooms, loss of seagrass and low oxygen levels, which can lead to large numbers of fish and other organisms dying. Many studies have examined how to prevent this runoff, but not much attention has been paid to removing the nutrients from the water. Some agencies have started programs to do this, and they are using shellfish to filter out unwanted substances. Geukensia demissa, known as the ribbed mussel, is one type of shellfish proposed for these programs. This mussel lives in various habitats and can filter bacteria, microalgae, and detritus containing nutrients and contaminants. In addition, this shellfish is not for sale on the commercial market, so these mussels aren't directly consumed by humans. To see whether G. demissa could clean up dirty water in an urban environment, Julie Rose, Eve Galimany and colleagues conducted a pilot experiment. The team equipped and deployed a raft stocked with local ribbed mussels in late June 2011 in an estuary at an industrial setting near New York City. The raft is a floating platform with beams and underwater ropes to which the mussels attach. The next spring, the researchers harvested the raft and studied the mussels. Overall, the mussels were healthy, and their tissues had high amounts of a local nitrogen isotope, indicating that they removed nitrogen from the water. Based on their study, the group estimates that a fully stocked raft would clean an average of 3 million gallons of water and remove about 350 pounds of particulate matter, like dust and soot, daily. In addition, they also determined that 138 pounds of nitrogen were potentially removed when the animals were harvested. Shellfish aquaculture is gaining acceptance as a tool to reduce nutrient over enrichment in coastal and estuarine ecosystems through the feeding activity of the animals and assimilation of filtered particles in shellfish tissues. 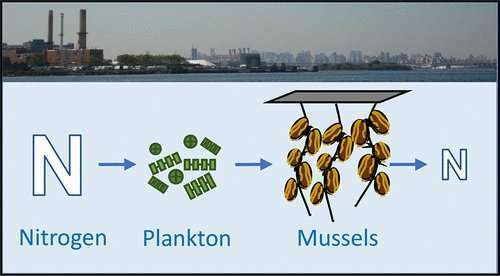 This ecosystem service, provided by the ribbed mussel (Geukensia demissa), was studied in animals suspended from a commercial mussel raft in the urban Bronx River Estuary, NY, in waters closed to shellfish harvest due to bacterial contamination. Naturally occurring populations of ribbed mussels were observed to be healthy and resilient in this highly urbanized environment. Furthermore, mussels grown suspended in the water column contained substantially lower concentrations of heavy metals and organic contaminants in their tissues than blue mussels (Mytilus edulis) collected at a nearby benthic site. Spat collection efforts from shore and within the water column were unsuccessful; this was identified as a key bottleneck to future large-scale implementation. Filtration experiments indicated that a fully stocked G. demissa raft would clear an average 1.2 × 107 L of Bronx River Estuary water daily, removing 160 kg of particulate matter from the water column, of which 12 kg would be absorbed into mussel digestive systems. At harvest, 62.6 kg of nitrogen would be sequestered in mussel tissue and shell. These values compare favorably to other resource management recovery methods targeting agricultural and stormwater nitrogen sources.